Paramore – It’s been a few years since this beloved band have come out with new music, but soon that is about to change! On Wednesday April 19th they released their first single, “Hard Times,” off their new album After Laughter. The single itself is a fun, upbeat song that depicts the struggles we face day in and day out. To be honest, upon reading the lyrics, I thought the song was about overcoming your obstacles, not continuously being in one, but I love it regardless. The music video, embedded below, was released simultaneously. It definitely brings the song to life even more, what with incorporating bright transitions and neon colors galore. And yes that is former band mate, Zac Farro, on drums. He’s back in the band! After Laughter drops May 12th. Sarah Close – Another music suggestion: Sarah Close’s EP: Caught Up, was released a couple of weeks ago and is a long overdue piece of art for her fans. The song “Caught Up” and the music video is an absolute “bop”! Siren – On Wednesday April 19th, Freeform held their 2017 Upfronts, and we learned about so many shows/films/events happening to the channel throughout 2017-2018. The one that really got my attention, however, was the upcoming drama, Siren. If you love mermaids/siren folklore like me, you should definitely check out this series. It takes place in Bristol Cove, which according to the official synopsis is, “a coastal town known for its legend of once being home to mermaids. When the arrival of a mysterious girl proves this folklore all too true, the battle between man and sea takes a very vicious turn as these predatory beings return to reclaim their right to the ocean.” We even got a first look at the trailer, which can be viewed below. There are no words to say how excited I am for this series! If you know me, you know I love anything related to mermaids. H2O: Just Add Water was pretty much what started my love for them, as well as was the first fandom I was a part of actually. I’m sure I’ll get into my love for these fantasy creatures in another post. But needless to say, I’m really looking forward to this series’ premiere in Summer 2018. 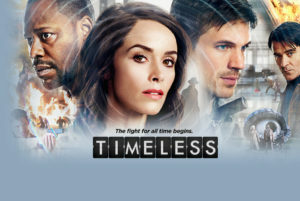 Timeless – While I wait anxiously for news about a renewal, I’ll share my love for NBC’s Timeless. The first season just finished airing a month or so ago, and though I resisted giving it a try at first, it didn’t take long for me to fall head-over-heels for it. This is the tale of Lucy Preston (Abigail Spencer), a history professor recruited by Homeland Security to try to stop Garcia Flynn (Goran Visnjic) from using a newly-invented time machine to go back in time and alter critical events in national and world history. She’s joined by Master Sergeant Wyatt Logan (Matt Lanter), a US Army Delta Force soldier, who’s there to protect the team and take out any threats, and Rufus Carlin (Malcolm Barrett), one of the time machine’s lead engineers and now reluctant pilot. See, there are two time machines: the Mothership, which Flynn stole, and its prototype, the Lifeboat. Lucy, Wyatt, and Rufus travel in the Lifeboat through various points in history, having adventures and mostly avoiding disaster. They soon learn that Flynn isn’t just trying to destroy the past: he’s attempting to take down the shadowy, powerful organization that killed his family. And then it turns out that this organization funded the development of the time machine in the first place. Naturally. All of the cast are fantastic. Matt Lanter, Goran Visnjic, and Malcolm Barrett are very nice to look at, as well. And of course, one of the show’s added draws for me (aside from fun historical recreation and clever dialogue) is the growing attraction between Lucy and Wyatt. I almost hate to recommend it in case NBC decides not to give it a second season. But it’s an excellent show – so good that it’s worth investing yourself in regardless of its renewal, in my opinion.